§ 405-20 Air safety and hazardous zoning. § 405-21 Conversion of dwellings. § 405-24 Fences, walls and hedges. § 405-25 Flood hazard requirements. § 405-27 Minimum off-street parking requirements. § 405-28 Minimum off-street loading requirements. § 405-30 Right to farm. § 405-32 Swimming pools and ponds. § 405-33 Recreation open space. § 405-34 Solar and wind energy-generating facilities; communications facilities. § 405-35 Renewable energy facilities. No person shall build, rebuild, create or cause to be built, rebuilt or created any object or structure, or shall plant or cause to be planted or permit to grow any tree or vegetation which will interfere with, diminish, change or obstruct the airspace or landing and takeoff area available for the landing and takeoff of aircraft at public use airports. This subsection shall not be construed to require the removal or lowering of or other change or alteration of any structure or tree not conforming to the rules promulgated by the Department of Transportation or otherwise interfere with the continuance of any nonconforming use as created herein. In order to expedite the handling of routine applications for permits where the resulting development would have negligible adverse impact under the purposes of this section, the Commissioner of the New Jersey Department of Transportation may institute, by written order, fast-track or five-day application review procedures. The Commissioner may also establish, by written order, classifications of permit applications and, for certain routine applications, a permit application fee of $25. In the event that an airfield owner or operator has an agreement with the Federal Aviation Administration for the control of airfield hazards, the airfield owner or operator shall comply with the most protective provisions of both this subsection and any agreement with the Federal Aviation Administration. Variances. No variance or other relief from the standards promulgated by or under this section may be granted by the Township to itself or any person except upon the condition that the variance or relief is contingent upon the issuance of a permit allowing the variance or relief by the Commissioner of the New Jersey Department of Transportation. Delineation of airport hazard areas. Methodology used to delineate airport hazard areas. An airport hazard area shall be established for each runway at an airfield. Each airport hazard area shall consist of a runway subzone, two runway end subzones and two clear zones. The overall airport hazard area for an airfield is geometrically constructed by defining and locating the runway subzone and runway end subzones for each runway open to the public on an airfield open to the public. The outermost borders of the subzone comprise the outermost boundary of the airport hazard area. The area within those outermost boundaries is that area regulated by the provisions of this subsection and is the airport hazard area for an airfield. The methodology used to delineate the overall construction and outermost boundaries of the airport hazard area for an airfield is further graphically depicted in Figure 3 below. Editor's Note: Figure 3, Bucks Airfield Graphic Depiction of the General Overall Construction and Outermost Boundaries of an Airfield Hazard Area, is included at the end of this chapter. Delineation of the runway subzone. The runway subzone of an airport hazard area shall consist of a rectangle having the same center line and length as the runway, unless a shorter length is necessitated by limited property ownership at the airport. The width of the runway subzone shall be 2,350 feet. For most airports, the length of the runway subzone will be the same as the physical length of the runway. If the physical end of a runway is closer than 200 feet from the property or easement line of the airport, as measured along the runway's extended center line, then the end of the runway subzone shall be defined by a line drawn perpendicular to the runway center line at a point 200 feet inside of the airport property or easement line. In that case, a portion of the runway will extend beyond the bounds of the runway subzone. The methodology used to delineate the runway subzone of an airport hazard area is illustrated in Figure 1. Editor's Note: Figure 1, Bucks Airfield Graphic Depiction of the General Construction of the Runway Subzone of an Airfield Hazard Area, is included at the end of this chapter. Delineation of the runway end subzones. The runway end subzones at an airport hazard area shall consist of trapezoids located at either end of the runway subzone along the flight approach and departure path. Each runway end subzone shall extend 3,000 feet from the end of the runway subzone, as measured along the extended center line of the runway. The base of the runway end subzone shall be defined by the end of the runway subzone and shall have a width of 2,350 feet. The width of the runway end subzone shall narrow as the distance from the end of the runway subzone increases. Its final width shall be 850 feet. The methodology used to delineate the runway end subzone of an airport hazard area is illustrated in Figure 2. Editor's Note: Figure 2, Bucks Airfield Graphic Depiction of the General Construction of the Runway End Subzone(s) of an Airfield Hazard Area, is included at the end of this chapter. Delineation of the clear zones. The clear zones of an airport hazard area shall consist of trapezoids located within the runway end subzone along the flight approach and departure path. Each clear zone shall extend 1,000 feet from the end of the runway subzone, as measured along the extended center line of the runway. The base of the clear zone shall be co-located with the end of the runway subzone and shall have a width of 250 feet. The width of the clear zone shall increase as the distance from the end of the runway safety zone increases. Its final width shall be 450 feet. The methodology used to delineate the clear zone of an airport hazard area is illustrated in Figure 7. There is hereby created Bucks Airfield hazard areas as delineated and shown on the map entitled "Bucks Airfield Hazard Areas" which is a part of this chapter. Editor's Note: Said map is included in the attachments at the end of this chapter. Minimum obstruction standards. Notwithstanding the provisions of this chapter, the primary regulation of airfield development, airfield property use, internal dimensional criteria and vertical development on airports is accomplished within N.J.A.C. 16:54. Methodology used to define vertical development allowed within an airport hazard area. Minimum obstruction standards as set forth herein establish the vertical limits up to which structures or trees may be allowed to be developed or grown within an airport hazard area. Minimum obstruction standards as set forth herein or established hereunder are vertical standards measured in respect to elevations whose datum is the horizontal plane established by runway elevations. For example, if a point in an airport hazard area permits at a specific point development up to "X" feet, that means "X" feet above the runway horizontal plane and not "X" feet above the natural grade. This provision is further graphically depicted in Figure 4. Editor's Note: Figure 4, Height Standards of Airfield Hazard Areas, is included at the end of this chapter. The vertical standards within the runway subzone of an airport hazard area are determined first by establishing the elevations at the runway center lines at the ends of the runway subzone of the airport hazard area. From those elevations at the runway subzone ends, a line is run 90° outward from each side of the runway center line for a distance of 125 feet. Within the area defined by these four points, no development is allowed above the natural grade of the soil except for runway and flight safety equipment. The vertical standards within the remainder of the runway subzone of an airport hazard area are determined by establishing planes from the edges of the longitudinal zero-foot development restriction line established in N.J.A.C. 16:62-3.2(b)1.ii which slope upward and outward at a rate of seven feet horizontally to one foot vertically. This upward plane ceases when it reaches the outer longitudinal borders of the runway subzone of any airport hazard area at the elevation of 150 feet above its starting point at the longitudinal zero-foot development line. The methodology used to establish the vertical standards within the runway subzone of an airport hazard area is further graphically depicted in Figure 5. Editor's Note: Figure 5, Vertical and Horizontal Planes of Runway Subzone of the Bucks Airfield Hazard Area, is included at the end of this chapter. The vertical standards within the runway end subzone of an airport hazard area are determined by first establishing a plane with a rising slope of one foot upward to 20 feet outward from the end of the runway subzone to the outermost end of the runway end subzone. This plane is bisected by the extended runway center line and is 250 feet in total width at its innermost dimension and widens uniformly along its three-thousand-foot length so as to have a total width of 850 feet at its outermost dimension where it intersects with the outermost portion of the runway end subzone at the elevation of 150 feet above its starting point at the zero-foot development line. The vertical standards within the remainder of the runway end subzone of an airport hazard area are determined by establishing sloping planes from the outermost longitudinal edges of the plane established in Subsection D(2)(d) hereinabove. These planes rise upward at a rate of one foot upward to seven feet outward from the plane established in Subsection D(2)(d) above to where they meet the outermost longitudinal boundaries of the runway end subzone at the elevation of 150 feet. The methodology used to establish the vertical standards with the runway end subzone of an airport hazard area is further graphically depicted in Figure 6. Editor's Note: Figure 6, Vertical and Horizontal Planes of Runway End Subzone of the Bucks Airfield Hazard Area, is included at the end of this chapter. Single-family dwelling units which are situated on a lot at least three acres in size and not located in a clear zone shall be permitted. Residential zoning is permitted in the clear zone as long as all dwellings are physically located outside of the clear zone. Airparks where the minimum lot size shall be at least three acres and which are not located in a clear zone. Commercial uses as set forth in the Schedule of District Regulations for any business/commercial zoning district within which the hazard area is located, provided that such commercial use is not located in a clear zone. Residential (dwelling units not situated on a lot of at least three acres in size). Planned unit development and multifamily dwellings. Aboveground bulk tank storage of compressed flammable or compressed toxic gases and liquids. Within the runway end subzones only, the aboveground bulk tank storage of flammable or toxic gases or liquids. Uses that may attract massing birds, including landfills. Above-grade major utility transmission lines and/or mains. Prohibited land uses are specifically prohibited without the written approval of the Commissioner of the New Jersey Department of Transportation. Prohibited uses may be allowed by said Commissioner on airfield property when they are determined necessary by the Director of the New Jersey Division of Aeronautics for air commerce purposes or for the operation of the airfield and its vendors directly serving air commerce needs. Permit for creation or expansion of a prohibited land use or vertical height development within an airport hazard area. The creation or establishment of the prohibited land use or vertical height development will not harm the public health, safety and welfare. No person may commence the construction or development of any structure, land use or condition which is contrary to the standards of this chapter without a valid permit issued by the Commissioner. In considering an application for a permit, the Director may confer with and seek additional information from the applicant or other interested party, agency or governmental organization. In the review of the application, the Department of Transportation may take into consideration any factor relevant to the hardship demonstrated by the applicant and any information relevant to the public health, safety and welfare. A developer of a project requiring creation or establishment of a prohibited land use or vertical height development shall first apply for developmental approval from the appropriate Township agency. If the Township agency approves of the development, that approval shall be conditioned on the developer applying for and receiving a permit from the Commissioner of the New Jersey Department of Transportation in accordance with the provisions of this section. Construction, development or creation of any prohibited land use shall not commence until and unless a permit has been issued by said Commissioner. An application for a permit will only be considered by the New Jersey Department of Transportation if accompanied by a letter from the Township requesting the permit. Copies of the completed airport hazard permit application form. A letter requesting issuance of a permit by the Department from a municipal agency having jurisdiction over the development, together with a copy of the conditional approval for development granted by the municipal agency, if required. A detailed statement of the hardship condition necessitating the application for variance or relief and a showing that the public health, safety and welfare will not be harmed by the creation of the prohibited land use or vertical height development. Certification that the applicable airfield owner(s) or authority were notified of the permit application by registered mail. Submission of a nonrefundable permit application fee of $75. Submission of site plans, specifications and construction drawings detailing the substance of the proposed development for which a permit is sought. Site plans shall bear the raised seal of a New Jersey licensed professional engineer, professional planner, land surveyor or architect and shall show the location of property lines, the location of runways, the boundaries of the airfield hazard area and elevations of proposed development showing where and by what amount the development exceeds the minimum standards for vertical development adopted under this chapter. Any other material deemed necessary to the permit application by the Director. Applications for permits issued under the provisions of this section and correspondence to the Department relating to the provisions of this section should be forwarded to the following address: New Jersey Department of Transportation, Division of Aeronautics, Air Safety and Hazardous Zoning Permits, 1035 Parkway Avenue, CN 600, Trenton, New Jersey 08625. For routine applications, review of an application shall be completed by the Division within 90 days of the date on which an application is accepted as complete. Nonroutine cases, requiring the review or approval of a federal agency or another state agency prior to issuance of a permit, shall be conducted in as timely fashion as possible. The Director shall notify the applicant of a delay in the review process necessitated by another agency's involvement. The notification shall be provided prior to 80 days following the date of acceptance of a complete application and shall include an estimate of the date by which a completion of the review process can be anticipated. For routine cases not requiring review by other agencies, the Division may, at its discretion, extend the ninety-day review period by 30 days if determined necessary to complete the review process. The applicant and the affected municipality shall be notified of this extension by the Department at least 15 days prior to the expiration of the ninety-day period. Following review of an application by the Division, the Director shall determine whether to recommend to the Commissioner that the permit be granted or denied. If the Director recommends denial, the applicant and municipal agency will be notified within five working days of the date of decision. An applicant who has been so notified by the Director may request an appeal before the Office of Administrative Law pursuant to N.J.S.A. 52:14B-1 et seq. and N.J.A.C. 1:1. The applicant shall notify the Division by certified mail within 14 calendar days of notification of denial that an appeal will be forwarded to the Office of Administrative Law. Pursuant to N.J.S.A. 52:14B-1 et seq. and N.J.A.C. 1:1, a final determination to either deny or grant the permit application will be made by the Commissioner subsequent to the filing of an initial decision by the administrative law judge who conducted the hearing. Approve the application as submitted. The applicant will receive a permit which shall be effective during the same period as the development approval granted by the municipal agency. The Department will mail a copy of the permit to the applicant and municipal agency within five working days of the date of approval. Deny the application. The Department will mail a copy of the permit denial to the applicant and municipal agency within five working days of the date of the decision. Phased or partial approval. Where conditions warrant, the Commissioner may provide for a phased approval of an application. The Commissioner may also approve part of an application and deny the remainder. The nature of approval granted, and of the denials, shall be transmitted to the applicant and the municipal agency within five working days. In areas not served by a public sanitary sewer system, the ratio of dwelling units to lot area shall be one dwelling unit per each half acre of land, but in no case shall more than three new dwelling units be created as a result of conversion. In areas served by a public sanitary sewer system, the number of dwelling units permitted as a result of conversion shall be determined by the habitable floor area of the dwelling involved, as set forth herein. In connection with any conversion of a dwelling, additions or alterations undertaken in the last three years from the date of such proposed conversion that added more than 10% to the previous floor space of the dwelling involved shall not be considered in determining that there is adequate space to install additional units. The floor area of the original dwelling shall not be enlarged nor the number of stories increased in connection with any dwelling unit conversion. Each dwelling unit resulting from a conversion shall contain at least two rooms in addition to a bathroom and kitchen and shall encompass 600 square feet of net floor area. One-bedroom units: 600 square feet. Two-bedroom units: 700 square feet. Three-bedroom units: 850 square feet. No efficiency units shall be permitted. The Planning Board may permit a greater or lesser amount of habitable floor area where, in its reasonable opinion, such is warranted by the specific circumstances of the particular building. There shall be no external entrance that faces a street and that is separate from any other external entrance to any dwelling on the same lot facing the same street, but this restriction shall not apply to two or more entrances in existence on December 31, 1987. Any additional dwelling units or professional offices shall be created only through internal conversions except for any required fire exits or escapes, which when required shall be placed at the rear of the building, unless such placement interferes with necessary exit requirements. The present existing exterior architectural design of the original dwelling shall be maintained to preserve the single-family dwelling character of the neighborhood. Each dwelling unit, professional office, guesthouse or boardinghouse resulting from a conversion shall provide parking area as provided in § 405-27 herein. All parking areas shall be located in the side or rear yard areas wherever possible. Each room resulting from such conversion shall be of reasonable size for the use intended and shall have adequate light and air from the outside which complies with the Uniform Construction Code, the Hotel and Multiple Dwelling Law, N.J.S.A. 55:13A-1 et seq., and/or any local housing regulations. Each dwelling unit resulting from such conversion shall have safe, adequate and convenient means of access and egress which complies with the Uniform Construction Code, the Hotel and Multiple Dwelling Law, N.J.S.A. 55:13A-1 et seq., and any local housing regulations. The owner of the dwelling must live within said dwelling as his/her principal place of residence. The maximum number of rooms for lease to the public shall be 12. The ratio of bathrooms to rooms for lease shall not be less than one bathroom for every three rooms. No meals may be provided or served except to current residents or guests of the house. The use shall comply with all provisions of the Uniform Construction Code, the Hotel and Multiple Dwelling Law, N.J.S.A. 55:13A-1 et seq., and/or any local housing regulations. Any sign proposed for said use shall comply with the provisions of § 405-31 contained herein. Parking area shall be provided as set forth in § 405-27 contained herein. A site plan review shall be required for any conversion of a dwelling unit as provided for in this section. All units resulting from conversions shall be subject to the provisions of Chapter 303 of this Code, where applicable. Not be objectionable by reason of dust, fumes, smoke or odor or be otherwise detrimental to the public health and safety. Not be found to cause an adverse effect. Be in accordance with the health standards and regulations of the Cumberland County Board of Health and any appropriate agencies of the New Jersey Department of Health and Senior Services and the Department of Environmental Protection. Be undertaken during normal working hours and not require the building, construction or establishment of a road or driveway to the dumping area. Not require the destruction or removal of existing trees of twenty-four-inch caliper or larger. Conform to the performance standards contained in § 405-62A(16). The site where the disposition of materials is made shall be rehabilitated to its natural state through regrading and landscaping. An application for a zoning permit to dump or deposit materials in the Township shall be made to the Zoning Officer in accordance with the procedures and subject to the requirements of a major site plan application as provided in § 405-69. Designated part of an easement purchase program project area as delineated by the Cumberland County Agricultural Development Board. The movement or disposing of clean gravel, earth or sand shall not be considered "dumping" for purposes of this section. The Planning Board may permit subdivisions of land for the installation of essential services. Any lot(s) created for an essential service shall be sized to meet the specified need involved, and the Board shall be assured that there is adequate area for provision of the essential service facility, on-site maneuverability and buffering from adjoining properties, if deemed necessary. Site plan review shall only be required in connection with an essential service facility which proposes the installation of a structure which will be above ground or which would require fencing around the facility or an entranceway to an underground structure. Site plan review will not be required in connection with the installation of underground lines within road rights-of-way or within specific easements established for said purpose. In any zoning district, fences, walls and hedges may be located within yard areas so long as they do not encroach on public rights-of-way or neighboring properties, provided that any fence, wall or hedge along the sides and front edge of any front yard shall not exceed a height of 2 1/2 feet (four feet where the fence, wall or hedge is not more than twenty-five-percent opaque) or be in conflict with the provisions of § 405-62A(39) of this chapter. For purposes of this section, a "hedge" shall be defined as any clustering or configuration of plant material in such a manner as to permanently or temporarily prohibit or inhibit unrestricted travel between properties or portions of properties or between the street or public right-of-way and a property. The Planning Board may modify this requirement upon request wherein it is deemed reasonable and appropriate to require the installation of a buffer between two properties in order to shield a residential use from a commercial or industrial use on an adjoining property or from some other objectionable condition such as a heavily traveled thoroughfare. A zoning permit shall not be required in connection with the construction of a fence or wall unless such fence or wall is to be built not in conformance with the provisions of this section. Statutory authorization. The Legislature of the State of New Jersey has, in N.J.S.A. 40:48-1, et seq., delegated the responsibility to local governmental units to adopt regulations designed to promote public health, safety, and general welfare of its citizenry. Therefore, the Township Committee of the Township of Upper Deerfield, of Cumberland County, New Jersey does ordain as follows. The flood hazard areas of the Township of Upper Deerfield are subject to periodic inundation which results in loss of life and property, health and safety hazards, disruption of commerce and governmental services, extraordinary public expenditures for flood protection and relief, and impairment of the tax base, all of which adversely affect the public health, safety, and general welfare. Definitions. Unless specifically defined below, words or phrases used in this section shall be interpreted so as to give them the meaning they have in common usage and to give this section its most reasonable application. Areas subject to inundation by one-percent-annual-chance shallow flooding (usually areas of ponding) where average depths are between one foot and three feet. Base flood elevations (BFEs) derived from detailed hydraulic analyses are shown in this zone. Areas subject to inundation by one-percent-annual-chance shallow flooding (usually sheet flow on sloping terrain) where average depths are between one foot and three feet. A request for a review of the Township program administrator's interpretation of any provision of this section or a request for a variance. A designated AO or AH Zone on a community's Digital Flood Insurance Rate Map (DFIRM) with a one-percent annual or greater chance of flooding to an average depth of one foot to three feet where a clearly defined channel does not exist, where the path of flooding is unpredictable and where velocity flow may be evident. Such flooding is characterized by ponding or sheet flow. The flood elevation shown on a published Flood Insurance Study (FIS), including the Flood Insurance Rate Map (FIRM). For Zones AE, AH, AO, and A1-30, the elevation represents the water surface elevation resulting from a flood that has a one-percent or greater chance of being equaled or exceeded in any given year. For Zones VE and V1-30, the elevation represents the stillwater elevation (SWEL) plus wave effect (BFE = SWEL + wave effect) resulting from a flood that has a one-percent or greater chance of being equaled or exceeded in any given year. The portion of the special flood hazard area (SFHA) starting from a Velocity (V) Zone and extending up to the landward limit of the moderate wave action delineation. Where no V Zone is mapped, the Coastal A Zone is the portion between the open coast and the landward limit of the moderate wave action delineation. Coastal A Zones may be subject to wave effects, velocity flows, erosion, scour, or a combination of these forces. Construction and development in Coastal A Zones is to be regulated the same as V Zones/coastal high-hazard areas. The official map on which the Federal Insurance Administration has delineated both the areas of special flood hazards and the risk-premium zones applicable to the community. A nonbasement building built, in the case of a building in an area of special flood hazard, to have the top of the elevated floor or, in the case of a building in a Coastal A Zone, to have the bottom of the lowest horizontal structural member of the elevated floor elevated above the base flood elevation plus freeboard by means of piling, columns (posts and piers), or shear walls parallel to the flow of the water, and adequately anchored so as not to impair the structural integrity of the building during a flood up to the magnitude of the base flood. In an area of special flood hazard, "elevated building" also includes a building elevated by means of fill or solid foundation perimeter walls with openings sufficient to facilitate the unimpeded movement of floodwaters. In areas of Coastal A Zones, "elevated buildings" also includes a building otherwise meeting the definition of "elevated building" even though the lower area is enclosed by means of breakaway walls. The lowest floor of the lowest enclosed area (including basement). An unfinished or flood-resistant enclosure, useable solely for the parking of vehicles, building access or storage in an area other than a basement, is not considered a building's lowest floor, provided that such enclosure is not built so to render the structure in violation of other applicable nonelevation design requirements of 44 CFR 60.3. Permanent construction does not include land preparation, such as clearing, grading and filling, nor does it include the installation of streets and/or walkways, nor does it include excavation for a basement, footings or piers, or foundations or the erection of temporary forms, nor does it include the installation on the property of accessory buildings, such as garages or sheds not occupied as dwelling units or not part of the main structure. For a substantial improvement, the actual start of construction means the first alteration of any wall, ceiling, floor, or other structural part of a building, whether or not that alteration affects the external dimensions of the building. A grant of relief from the requirements of this section that permits construction in a manner that would otherwise be prohibited by this section. The failure of a structure or other development to be fully compliant with this section. A new or substantially improved structure or other development without the elevation certificate, other certifications, or other evidence of compliance required in 44 CFR § 60.3(b)(5), (c)(4), (c)(10), (e)(2), (e)(4), or (e)(5) is presumed to be in violation until such time as that documentation is provided. Lands to which this section applies. This section shall apply to all areas of special flood hazards within the jurisdiction of the Township of Upper Deerfield, Cumberland County, New Jersey. A scientific and engineering report "Flood Insurance Study, Cumberland County, New Jersey (All Jurisdictions)," dated June 16, 2016. "Flood Insurance Rate Map for Cumberland County, New Jersey (All Jurisdictions)" as shown on Index and panel(s) 34011C0020E, 34011C0040E, 34011C0045E, 34011C0135E, 34011C0153E, 34011C0154E, 34011C0155E, 34011C0160E, 34011C0162E and 34011C0170E, the effective date of which is June 16, 2016. The above documents are hereby adopted and declared to be a part of this section. The Flood Insurance Study, maps and advisory documents are on file at 1325 Highway 77, Seabrook, New Jersey. Penalties for noncompliance. No structure or land shall hereafter be constructed, relocated to, extended, converted, or altered without full compliance with the terms of this section and other applicable regulations. Violation of the provisions of this section by failure to comply with any of its requirements (including violations of conditions and safeguards established in connection with conditions) shall constitute a misdemeanor. Any person who violates this section or fails to comply with any of its requirements shall upon conviction thereof be fined not more than $500 or imprisoned for not more than 90 days, or both, for each violation, and in addition shall pay all costs and expenses involved in the case. Nothing herein contained shall prevent the Township of Upper Deerfield from taking such other lawful action as is necessary to prevent or remedy any violation. Abrogation and greater restrictions. This section is not intended to repeal, abrogate, or impair any existing easements, covenants, or deed restrictions. However, where this section and another ordinance, easement, covenant, or deed restriction conflict or overlap, whichever imposes the more stringent restrictions shall prevail. The degree of flood protection required by this section is considered reasonable for regulatory purposes and is based on scientific and engineering considerations. Larger floods can and will occur on rare occasions. Flood heights may be increased by man-made or natural causes. This section does not imply that land outside the area of special flood hazards or uses permitted within such areas will be free from flooding or flood damages. This section shall not create liability on the part of the Township of Upper Deerfield, any officer or employee thereof or the Federal Insurance Administration for any flood damages that result from reliance on this section or any administrative decision lawfully made thereunder. Designation of the local administrator. The Township's program administrator is hereby appointed to administer and implement this section by granting or denying development permit applications in accordance with its provisions. Review all development permits to determine that the permit requirements of this section have been satisfied. Review all development permits to determine if the proposed development is located in the floodway. If located in the floodway, assure that the encroachment provisions of Subsection E(3)(a) are met. Review all development permits in the Coastal A Zone area of the area of special flood hazard to determine if the proposed development alters the terrain or sand dunes so as to increase potential flood damage. Review plans for walls to be used to enclose space below the base flood level in accordance with Subsection E(4)(b). Use of other base flood and floodway data. When base flood elevation and floodway data has not been provided in accordance with Subsection C(2), Basis for establishing the areas of special flood hazard, the Township's program administrator shall obtain, review, and reasonably utilize any base flood elevation and floodway data available from a federal, state or other source, in order to administer Subsections E(2)(a), Specific standards, residential construction, and E(2)(b), Specific standards, nonresidential construction. Maintain the floodproofing certifications required in Subsection D(1)(c). In Coastal A Zone areas, certification shall be obtained from a registered professional engineer or architect that the provisions of Subsection E(4)(b) and [a] and [b] are met. Maintain for public inspection all records pertaining to the provisions of this section. After an event resulting in building damages, assess the damage to structures due to flood and non-flood causes. Record and maintain the flood and non-flood damage of substantial damage structures and provide a letter of substantial damage determination to the owner and the New Jersey Department of Environmental Protection, Dam Safety and Flood Control Section. Ensure substantial improvements meet the requirements of Subsections E(2)(a), Specific standards, residential construction, and E(2)(b), Specific standards, nonresidential construction. Interpretation of FIRM boundaries. The program administrator shall make interpretations, where needed, as to the exact location of the boundaries of the areas of special flood hazards (for example, where there appears to be a conflict between a mapped boundary and actual field conditions). The person contesting the location of the boundary shall be given a reasonable opportunity to appeal the interpretation as provided in Subsection D(4). The Planning Board as established by the Township Committee shall hear and decide appeals and requests for variances from the requirements of this section. The Planning Board shall hear and decide appeals when it is alleged there is an error in any requirement, decision, or determination made by the Township's program administrator in the enforcement or administration of this section. Those aggrieved by the decision of the Planning Board, or any taxpayer, may appeal such decision to the Superior Court, as provided in statute. Upon consideration of the factors of Subsection D(4)(a) and the purposes of this section, the Planning Board may attach such conditions to the granting of variances as it deems necessary to further the purposes of this section. The Township's program administrator shall maintain the records of all appeal actions, including technical information, and report any variances to the Federal Insurance Administration upon request. Generally, variances may be issued for new construction and substantial improvements to be erected on a lot of one-half acre or less in size contiguous to and surrounded by lots with existing structures constructed below the base flood level, providing items [a] through [k] in Subsection D(4)(a) have been fully considered. As the lot size increases beyond the one-half acre, the technical justification required for issuing the variance increases. A determination that the granting of a variance will not result in increased flood heights, additional threats to public safety, extraordinary public expense, create nuisances, cause fraud on or victimization of the public as identified in Subsection D(4)(a), or conflict with existing local laws or ordinances. Enclosure openings. All new construction and substantial improvements having fully enclosed areas below the lowest floor that are usable solely for parking of vehicles, building access or storage in an area other than a basement and which are subject to flooding shall be designed to automatically equalize hydrostatic flood forces on exterior walls by allowing for the entry and exit of floodwaters. Designs for meeting this requirement must either be certified by a registered professional engineer or architect or must meet or exceed the following minimum criteria: A minimum of two openings in at least two exterior walls of each enclosed area, having a total net area of not less than one square inch for every square foot of enclosed area subject to flooding, shall be provided. The bottom of all openings shall be no higher than one foot above grade. Openings may be equipped with screens, louvers, or other covering or devices, provided that they permit the automatic entry and exit of floodwaters. For Coastal A Zone construction see section 5.4 Coastal A Zone. Require within any AO or AH zone on the municipality's FIRM that all new construction and substantial improvement of any residential structure shall have the lowest floor, including basement together with the attendant utilities and sanitary facilities, elevated above the depth number specified in feet plus one foot, above the highest adjacent grade (at least three feet if no depth number is specified). And, require adequate drainage paths around structures on slopes to guide floodwaters around and away from proposed structures. Be certified by a registered professional engineer or architect that the design and methods of construction are in accordance with accepted standards of practice for meeting the applicable provisions of this subsection. Such certification shall be provided to the official as set forth in Subsection D(3)(c)[b]. Manufactured homes shall be anchored in accordance with Subsection E(1)(a). If Subsection E(3)(a) is satisfied, all new construction and substantial improvements must comply with Subsection E, Provisions for flood hazard reduction. In all areas of special flood hazard in which base flood elevation data has been provided and no floodway has been designated, the accumulative effect of any proposed development, when combined with all other existing and anticipated development, shall not increase the water surface elevation of the base flood more than 0.2 of a foot at any point. With all space below the lowest floor's supporting member open so as not to impede the flow of water, except for breakaway walls as provided or in Subsection E(4)(b). Prohibit the use of fill for structural support of buildings within Coastal A Zones on the community's FIRM. Certification. A registered professional engineer or architect shall develop or review the structural design specifications and plans for the construction and shall certify that the design and methods of construction to be used are in accordance with accepted standards of practice for compliance with the provisions of Subsection E(4)(b) and [a] and [b]. Any alteration, repair, reconstruction or improvement to a structure started after the enactment of this section shall not enclose the space below the lowest floor unless breakaway walls, open wood lattice-work or insect screening are used as provided for in this subsection. Sand dunes: prohibit man-made alteration of sand dunes within Coastal A Zones on the community's DFIRM which would increase potential flood damage. No home occupations shall require interior or exterior alterations of the principal structure. Home occupations shall be limited to one per principal structure and shall be operated by a resident(s) of the dwelling unit in which it is located. No display of products shall be visible from the street, and the sale of merchandise as the principal business shall be prohibited. In the case of duplex, semidetached, townhouse or apartment dwelling units, home occupations shall only be permitted as a conditional use wherein the home occupation shall only be permitted to involve residents of the unit involved, and no nonresident employees shall be permitted. Be carried on entirely within the principal structure. Not occupy more than 25% of the principal structure. Permit the employment of no more than one employee not living on said premises. Parking spaces required to be provided in accordance with § 405-27 of this chapter for any home occupation in addition to those required of residential units shall not be located in any required front or side yard areas. Signs for home occupations shall be in accordance with the provisions of § 405-31 of this chapter. Each building or site which, after the effective date of this chapter, is erected, enlarged or altered for any of the following uses in any district shall provide and satisfactorily maintain the minimum number of off-street parking spaces set forth herein. Where a particular building or site contains more than one of the following categories of uses, the total parking requirement shall be the sum of the component parts. For residential developments, parking shall be provided as set forth in Table 405-27.1 below. If the applicant does not specify the number of bedrooms per unit, Note 3 for each category in Table 405-27.1 shall apply for the parking requirement. Alternative parking standards to those shown in Table 405-27.1 shall be accepted if the applicant demonstrates these standards better reflect local conditions. Factors affecting minimum number of parking spaces include household characteristics, availability of mass transit, urban versus suburban location, and available off-site parking resources. Each garage car space shall be counted as 1.0 off-street parking space regardless of the dimensions of the driveway. A one-car garage and driveway combination shall count as 2.0 off-street parking spaces, provided the driveway measures a minimum of 18 feet in length between the face of the garage door and the right-of-way. A two-car garage and driveway combination shall count as 3.5 off-street parking spaces, provided a minimum parking width of 20 feet is provided for a minimum length of 18 feet as specified for a one-car garage and driveway combination. When housing is included in mixed-use development, a shared parking approach to the provision of parking shall be permitted. When, in the judgment of the local approving authority, on-street parking is available, then only that proportion of the parking requirement which is not available on the street shall be provided in off-street parking facilities. A length of 23 feet per on-street parking space shall be used in calculating the number of available on-street parking spaces. Values shall be commensurate with the most appropriate housing unit type and size noted above that the retirement community resembles. Values shall be commensurate with the most appropriate housing unit type and size noted above that the recreational homes (owner-occupied) resemble. 1 When determination of the required number of parking spaces results in a fractional space for the entire development, any fraction of 1/2 or less may be disregarded, while a fraction in excess of 1/2 shall be counted as one parking space. 2 Requirements for attached units (apartment/condominium/townhouse) include provisions for guest parking (0.5 spaces per dwelling unit). Guest parking must either be provided for on street or in common parking areas. 3 If the applicant does not specify the number of bedrooms per unit, this parking requirement shall apply. Day-care center: four parking spaces for each 1,000 square feet of gross floor area. Day-care center, adult: one parking space for each 10 adult clients, or fraction thereof, or one space for each staff member, whichever results in the greater number of spaces. Rooming houses, guesthouses or boardinghouses, dormitories, sororities, fraternities and other similar places providing living accommodation: one off-street parking space for each three beds, plus one parking space for the resident owner or manager and each employee. Place of religious worship: one off-street parking space for each four seats provided for patron use or at least one off-street parking space for each 50 square feet of gross floor area used or intended to be used for service to patrons, guests or members, whichever requires the greater number of off-street parking spaces, plus one additional space for each full-time employee. Religious, sectarian and nonsectarian, denominational, private school or public school not conducted as a private gainful business, kindergarten and elementary school: one off-street parking space for each faculty member and employee, plus one space per two classrooms and offices. Junior high school: one off-street parking space for each faculty member and employee, plus one space per two classrooms and offices. Senior high school: one off-street parking space per faculty member and employee, plus one space per 10 students of projected building capacity. College and junior college: one off-street parking space per faculty member and employee, plus one space for each 10 classroom seats or one off-street parking space for each 10 auditorium seats, whichever formula will require the larger number of parking spaces. Library or museum not conducted as a private gainful business: one space per five seats or one space per 250 square feet of gross floor area where no seats are provided. Recreation facilities: one off-street parking space for each five persons of total permitted capacity. In the case of campgrounds, one space per campsite, plus visitor parking as provided for recreational facilities and one parking space for each employee. Golf course: four spaces per hole plus one space for every 2.5 seats in a restaurant. Private club or lodge not operated as a private gainful business: one off-street parking space for every five members of total capacity or at least one off-street area used or intended to be used for service to customers, patrons, clients, guests or members, whichever requires the greater number of off-street parking spaces, plus one additional space for each full-time employee. Hospital or nursing home: one off-street parking space for each three patient or inmate beds, plus at least one additional off-street parking space for each staff and visiting doctor, plus one additional off-street parking space for each employee, including nurses, on the two major shifts. Medical, dental or veterinary office: five off-street parking for each 1,000 square feet or fraction thereof of gross floor area. Medical lab and research facility: four parking spaces for each 1,000 square feet or fraction thereof of gross floor area. Banks, business, professional other than medical or governmental offices: four off-street parking spaces for each 1,000 square feet or fraction thereof of gross floor area. Government offices: one space for each vehicle assigned to the building plus one space for every three seats in any general meeting rooms, auditoriums and courtrooms. Auto sales, farm equipment and supplies: one space for every 325 square feet of gross floor area plus one space for each employee. Personal services: four off-street parking spaces for each 1,000 square feet or fraction thereof of gross floor area. Restaurant: 10 off-street parking spaces for each 1,000 square feet or fraction thereof of gross floor area. Restaurant, Take-out: 12 parking spaces for each 1,000 square feet or fraction thereof of gross floor area. Repair shop for such goods as appliances, watches, bicycles and locks: 4.5 off-street parking spaces for each 1,000 square feet or fraction thereof of gross floor area. Mortuary or funeral home: one off-street parking space for each four seating accommodations or at least one off-street parking space for each 50 square feet of gross floor area used or intended to be used in the operation of the establishment, whichever requires the greater number of off-street parking spaces, plus one additional space for each full-time employee. Motel or hotel: one off-street parking space for each rental room or suite, plus one additional space for each two employees. Where there is a meeting or conference room or rooms, there shall also be provided one off-street parking space for each four persons of the total maximum safe occupancy of the meeting room(s). If other uses are incorporated into or a part of any motel or hotel, additional spaces shall be provided in accordance with this Subsection A. Public entertainment facilities: one off-street parking space for each four seating accommodations provided or at least one off-street parking space for each 50 square feet of gross floor area used or intended to be used for service to customers, patrons, clients, guests or members, whichever requires the greater number of off-street parking spaces, plus one additional space for every two full-time employees. Gasoline service station: one off-street parking space for every four, or fraction thereof, fueling stations. Said off-street parking spaces are not to be part of nor interfere with the accessways to the pumps. Gasoline service station with auto repair service: one parking space for every four fueling stations, or fraction thereof, plus one space for each service bay. Gasoline service station with convenience store: five parking spaces for each 1,000 square feet or fraction thereof of gross floor area, plus one space for each four fueling stations. Automotive sales or rental and/or repair: one off-street parking space for each 300 square feet of gross floor area, plus one additional space for each full-time employee. Car wash, automatic operation: one parking space for every two employees, three stacking spaces, and two drying spaces. Car wash, self-service: three stacking spaces and two drying spaces for each wash bay. Industrial uses: three off-street parking spaces for every five employees on the largest shift, plus one space for each company vehicle normally stored on the premises. Home occupation: three off-street parking spaces in addition to spaces otherwise required. The Planning Board shall require additional off-street parking spaces when, in its opinion, the proposed use necessitates additional spaces. In determining the number of additional spaces, the Board shall be guided by the provisions of this section. Retail and service stores, except when otherwise specifically covered herein: 4.5 parking spaces for every 1,000 square feet or fraction thereof of gross floor area. Stores for the retail sale of furniture, appliances or hardware: two parking spaces for every 1,000 square feet or fraction thereof of gross floor area. Supermarkets and self-service food stores: 5.5 parking spaces for every 1,000 square feet or fraction thereof of gross floor area. Shopping centers: 5.0 spaces per every 1,000 square feet of gross leasable area, in addition to any area required for vehicle and pedestrian passageways. Additional area may be required for landscaping and buffering. Specific requirements for individual uses listed elsewhere will be waived when such uses are an integral part of a planned shopping center. Sanatoriums or convalescent homes: one off-street parking space for each six patient beds, plus one additional space for each staff or visiting doctor, plus one additional space for each four employees, including nurses. Flea markets and outdoor auctions or sales: three off-street parking spaces for each table or booth in a flea market, plus one additional space for any employees of market operation. For auctions and sales: one off-street parking space for every 150 square feet of gross floor or ground area utilized in the sale, plus one additional space for any employees of the auction or sale organization. Roadside stands: three parking spaces for every 100 square feet of display area. Commercial communication facility: one parking space for each employee. Wholesale business: one parking space for each 1,000 square feet or fraction thereof of gross floor area. Warehouse: 0.5 parking space for each 1,000 square feet or fraction thereof of gross floor area. Theatre, auditorium, arena: one parking space for each 2.5 seats of design capacity. Other uses: to be determined by the Planning Board based upon the requirements contained herein for similar uses and the factors generating parking need, such as number of patrons, floor area, seating capacity or availability of other means of public transportation. When determining the number of parking spaces required to be provided for the proposed combination or mixture of uses, the number of spaces required shall be determined by calculating the number of spaces required as per this section for each use, individual use involved in said combination, or mixture of uses and then adding all such calculations together. General regulations applying to required off-street parking facilities. Structures and uses in existence at the date of adoption of this chapter shall not be subject to the requirements of this section so long as the kind or extent of use is not changed, provided that any parking facility now serving such structures or uses shall not in the future be reduced below such requirements. Whenever there is an alteration of a structure or a change or extension of a use which increases the parking requirements according to the standards for this chapter, the total additional parking required for the alteration, change or extension shall be provided in accordance with the requirements of this section. No parking area shall be used for any use that interferes with its availability for the parking need it is required to serve. All required parking facilities shall be provided and maintained so long as the use exists which the facilities were designed to serve. Off-street parking facilities shall not be reduced in total extent after their provision except upon the approval of the Planning Board and then only after proof that, by reason of diminution in floor area, seating area, the number of employees or change in other factors controlling the regulation of the number of parking spaces, such reduction is in conformity with the requirements of this section. Reasonable precautions shall be taken by the owner or sponsor of particular uses to assure the availability of required facilities to the employees or other persons the facilities are designed to serve. Such facilities shall be designed and used in such a manner as to at no time constitute a nuisance or a hazard or unreasonable impediment to traffic. Where the computation of required parking space results in a fractional number, any fraction of the next highest number shall be counted as one. In computing the required number of parking spaces as set forth in Subsection A above, required handicapped parking spaces may not be used in the computation. Where a site is proposed to include or have more than one land use or activity, required parking spaces shall be computed based on each use or activity proposed. Off-site parking facilities shall include compliance with § 218-1 of the Code of the Township of Upper Deerfield with respect to the inclusion, designation and creation of fire lanes with respect to such development in which fire lanes are required. That the owner or owners of two or more establishments shall submit with their application for conditional use a site plan showing joint use and location of a common off-street parking area. That some portion of the common off-street parking area lies within 200 feet of an entrance regularly used by patrons into the building served thereby. That the Planning Board may, in its discretion, reduce the required aggregate amount of required parking space upon determination that the greater efficiency is effected by joint use of a common parking area, but in no case shall the ratio of total off-street parking area to total sales floor area be reduced to less than 25%. That said parking area is not to be located across the street, roadway or thoroughfare where a pedestrian crossing, such as an overpass or traffic signal, is not provided for persons utilizing said parking area. The garage shall conform to the setback requirements contained in the Schedule of District Regulations for the district within which it is located. Editor's Note: The Schedule of District Regulations is included as an attachment to this chapter. No commercial parking lot shall hereafter be erected or placed within 100 feet of any residential district. No commercial parking lot shall have an entrance or exit connected with a public street at a point closer than 200 feet, measured along the same street line in the same block, to any single-family detached, semidetached or attached residence, church, library, charitable institution, school, college, nursing home or hospital and similar uses or any entrance or exit thereto. Parking garages, public or private, may be constructed as part of a structure or as a separate structure. No garage shall be built lower than two levels ("levels" being defined as underground stories) below ground level. Appropriate barriers shall be constructed so as to prevent glare or noise from automobiles making a nuisance for adjoining properties or uses. The lot is to be used only for the parking of passenger automobiles of employees, customers or guests of the person, firm or organization controlling and operating the lot, who shall be responsible for its maintenance. No charge is to be made for parking in the lot unless such a fee is charged in connection with a condominium ownership of the lot by a group of homeowners, tenants or residents. The lot is not to be used for sales, repair work or servicing of any kind, including the washing of cars. Entrances to and exits from the lot are to be located so as to do the least harm to the residence district. Such lots are not to be considered commercial lots as referred to in Subsection E herein. No advertising sign or material is to be located on the lot. All parking is to be kept back of the setback building line by a barrier unless otherwise specifically authorized by the Planning Board. The parking lot and that portion of the driveway back of the building line is to be adequately screened from the street and from adjoining property in a residence district by a hedge not less than five feet wide or appropriate fencing or wall not more than five feet high and also located behind the setback building line. All lighting is to be arranged so that there will be no glare therefrom annoying to the occupants of adjoining properties in a residence district. Where appropriate and deemed necessary, the Planning Board may impose such other reasonable conditions as will assure the least harm or disruption of the residence district where such a parking lot is proposed. Editor's Note: Former Subsection H, regarding commercial vehicles and vehicles weighing more than 8,000 pounds, added 9-1-1988 by Ord. No. 316, which immediately followed this subsection, was deleted 1-19-1996 by Ord. No. 449. Travel trailers, including mobile homes used for recreational purposes, may be stored on the property of their owner and shall be considered as an accessory use and subject to the standards set forth in the Schedule of District Regulations for an accessory use in the district in which said travel trailer or recreational vehicle is to be stored. No travel trailer, recreational mobile home or recreational vehicle shall be occupied or used as a dwelling place or for the conduct of any business. There shall be no hookup of a travel trailer, recreational mobile home or recreational vehicle to any utility line or facility. The storage of such vehicles shall not be in any front yard area. Editor’s Note: Former Subsection I, added 9-1-1988 by Ord. No. 316, regarding junk, unregistered and/or unlicensed vehicles, was repealed 2-15-2018 by Ord. No. 769. Motorcycle parking. Any site which has 500 or more parking spaces shall provide, for the first 500 spaces and one for each 250 spaces thereafter, a seventeen-foot-by-eighteen-foot motorcycle parking area, bordered by bumper guards or a concrete curb to preclude automobile access to such area. Motorcycle spaces are to be clearly designated and located near the main entrance of the primary structures on site. Warehouses and wholesale uses. Office space exceeding 30% of the gross floor area of the warehouse or wholesale use must meet the off-street parking requirements for office use. Day-care facilities. Day-care facilities providing care or instruction to 10 or more individuals at any one time shall provide a passenger loading/unloading zone. Parking during construction. Temporary off-street parking shall be provided for workers during construction at a rate of one space per each two employees. Temporary gravel surfacing may be permitted for the temporary parking area. Temporary parking areas must be abandoned and returned to their original state or improved in accordance with an approved site plan prior to the issuance of a certificate of occupancy. The parking facilities are designed and developed as a single on-site common parking facility, or as a system of on-site and off-site facilities, if all facilities are connected with improved pedestrian facilities and no building or use involved is more than 800 feet walking distance from the most remote shared facility. The Planning Board will determine the amount of reduction, provided the total number of parking spaces in the common parking facility is not less than the minimum required spaces for any single use. If any requirements for shared parking are violated, the affected property owners must provide a remedy satisfactory to the Planning Board or provide the full amount of required off-street parking for each use, in accordance with the requirements of this section, unless a satisfactory alternative remedy is approved by the Planning Board. Planter overhangs. 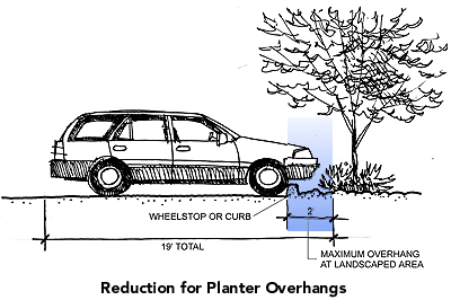 When a parking space abuts a landscape island or planter, the front two feet of the parking space may overhang the planter, provided that wheel stops or curbing is provided as illustrated below. Purpose. Supplemental standards are provided for uses with drive-through facilities to ensure protection from potential traffic hazards. These standards are applied in addition to all other applicable standards of this Code. Standards. The provisions of this section shall apply to all drive-through service facilities. Any commercial activity such as a bank, pharmacy, car wash, photo pickup, retail, or other similar use providing services accessible to persons who remain in their automobiles shall provide a stacking lane designed to accommodate not less than four vehicles at each service location. Drive-through service windows at restaurants shall provide a stacking lane designed to accommodate a minimum of six vehicles at each service window. Each vehicle space shall be a minimum 10 feet by 20 feet in size. The minimum distance from any drive-through facility to any residential area shall be 40 feet. This distance is measured at the narrowest point between the property line of the residential property and either the main building, an off-street parking area, or stacking lanes, whichever is closer. The setback must be landscaped in accordance with § 405-62A of the Township Code. Bypass lane. A bypass lane shall be provided. The minimum width shall be 10 feet. Each stacking lane shall be separated from the circulation routes necessary for ingress or egress from the property, or access to any parking space. Access to stacking lanes shall not be allowed directly from a driveway, from a public street or from adjoining lots. The stacking lane shall be designed to accommodate at least the minimum stacking required for each use. Stacking lanes for drive-through stations shall not cross or pass through off-street parking areas or pedestrian accessways. Two or more lanes: 10 feet per lane. Stacking lanes for drive-through facilities shall not be located in the required front or corner side yard. Requirements for existing drive-through uses. When existing drive-through uses apply for occupancy permits, modification of existing use permits, or site plan approval, they will be required to meet as many of the supplemental standards as reasonably possible as determined by good planning and engineering practice within the limits of the existing site layout and structural location. Design, designation, and location. Handicapped persons' parking spaces shall, at a minimum, comply with the requirements of the New Jersey Barrier Free Subcode and the Americans with Disabilities Act Accessibility Guidelines, and shall be considered part of the total number of required spaces. A maximum of 30% of the total required off-street parking stalls may be permitted and designated for compact cars in commercial and retail areas. For industrial uses, compact stalls shall not exceed 30% of the total off-street parking requirement. Each compact stall shall be designated as such. The maximum compact car allowance may be exceeded if an applicant submits a vehicle composition study, relevant to the type of development, which demonstrates that a greater number of compact vehicles should be accommodated. For all commercial, office, industrial, mixed-use and multifamily residential development activity involving new construction, bicycle parking shall be provided, as required in Table 405-27.3 of this Subsection J. If the total of the existing such area(s) is increased 10% or less, no bicycle parking is required. If the total of the existing such area(s) is increased more than 10% but less than 50%, the minimum bicycle parking space requirement shall be provided as specified in the schedule of off-street bicycle parking requirements set forth in Table 405-27.3 of this Subsection J. If the total of the existing such area(s) is increased 50% or more, the total bicycle parking requirement shall be provided, as specified in the schedule of off-street bicycle parking requirements set forth in Table 405-27.3 of this Subsection J. General Requirements for bicycle facilities. In any development required to provide 10 or more parking spaces, bicycle parking shall be provided. 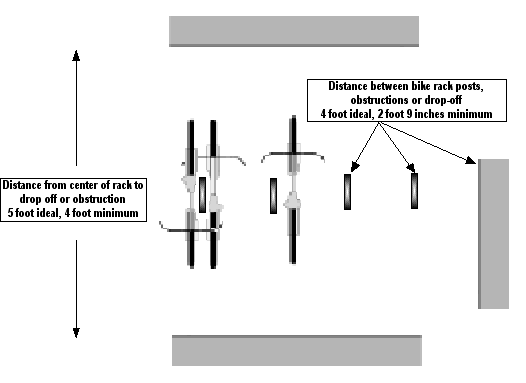 For each bicycle parking space required, a stationary rack shall be provided which can accommodate bicyclists' locks securing the frame and wheels, or a lockable enclosure in which the bicycle is stored. Bicycle parking shall have direct access to both the public right-of-way and to the main entrance of the principal use. For facilities with multiple buildings, building entrances or parking lots, bicycle parking shall be located in areas of greatest use and convenience to bicyclists. Bicycle parking facilities shall be separated from motor vehicle parking and maneuvering areas by a barrier or sufficient distance to prevent damage to the parked bicycles. If any motor vehicle parking is covered, required bicycle parking must also be covered. Each required bicycle parking space shall be at least two feet wide and six feet long and, when covered, provide a vertical clearance of seven feet. An access aisle of at least five feet wide shall be provided and maintained beside or between each row of bicycle parking. Vertical clearance may be four feet in an enclosed bicycle locker. Each required bicycle parking space must be accessible without moving another bicycle. All bicycle racks, lockers, or other facilities shall be securely anchored to the ground or to a structure and must hold bicycles securely by means of the frame. The frame must be supported so that the bicycle cannot be pushed or fall to one side in a manner that will damage the wheels. Lighting shall be provided in a bicycle parking area so that all facilities are thoroughly illuminated and visible from adjacent sidewalks or motor vehicle parking lots during all hours of use. Bicycle parking shall be at least as well-lit as motor vehicle parking. Areas set aside for required bicycle parking must be clearly marked and reserved for bicycle parking only. Where bicycle parking facilities are not directly visible and obvious from the public right(s)-of-way, entry and directional signs shall be provided to direct bicyclists from the public right-of-way to the bicycle parking facility. Directions to employee parking facilities may be signed or supplied by the employer as appropriate. Outdoor bicycle parking facilities shall be surfaced in the same manner as the automobile parking area or with a suitable surface (i.e., asphalt, concrete, pavers, or similar material) maintained in a smooth, durable, and well-drained condition. Bicycle parking may be provided within the public right-of-way in zoning districts where no front setback is required, subject to approval of the Planning Board. The required minimum number of bicycle parking spaces for each use category is shown on Table 405-27.3. Bicycle parking shall be located on-site within 50 feet of well-used entrances and not farther from the entrance than the closest motor vehicle parking space. Bicycle parking for multiple uses, such as a commercial center, may be clustered in one or several locations but must meet all other requirements for bicycle parking. For buildings with multiple entrances, required bicycle parking shall be distributed proportionally at the various public entrances, while employee parking shall be located at the employee entrance, if applicable. Bicycle rack facilities for separate uses may be provided collectively if the total number of spaces so provided is not less than the sum of the separate requirements governing the number of spaces required in relation to the use served. Such facilities shall be located on one of the lots on which a use served is located or on a lot abutting and contiguous to one of the lots on which a use served is located; provided, that such facilities are also located not more than 300 feet walking distance from all of the buildings, structures, or uses of land which such bicycle rack facilities are intended to serve. Schedule of off-street bicycle parking requirements. Bicycle parking requirements do not reduce the vehicle parking requirements set forth in § 405-27A of this chapter, but provide bicycle parking in addition to vehicle parking. All references to vehicle parking requirements refer to the parking requirements set forth in § 405-27A of this chapter. Number of bicycle parking spaces. For residential uses with seven dwelling units, one unit of bicycle parking shall be provided. For residential uses with more than seven dwelling units, bicycle parking shall be provided at a ratio of one bicycle parking space for every three additional residential units. Any fraction of 1/2 or greater shall require one additional bicycle parking space. *Any fraction of 1/2 or greater shall require one additional parking space. A minimum of one space per nonresidential use shall be provided, except that, where more than one use shall be located in one building or where multiple uses are designed as part of a self-contained complex, the number of loading spaces shall be based on the cumulative number of square feet within the building or complex and shall be dispersed throughout the site to best serve the individual uses. Where any use is located on a tract of at least 50 acres and no portion of a loading area, including maneuvering areas, is closer than 200 feet to any property line and where the length of the driveway connecting the loading area to the street is at least 300 feet, the number of off-street loading spaces may be fewer than the number required by the above schedule, provided that the applicant, as part of the site plan application, shall indicate on the site plan and shall document to the approving authority that the number of spaces to be provided will be adequate to meet the needs of the specific use proposed. Reasonable precautions shall be taken by the owner or sponsor of particular uses to assure the availability of required facilities to the delivery and pickup vehicles that they are designed to serve. Access to a loading space shall be provided directly from a public street or alley or from any right-of-way that will not interfere with public convenience and that will permit orderly and safe movement of trucks or delivery vehicles. Loading space(s) as required under this section shall be provided as area in addition to off-street parking space and shall not be considered as supplying off-street parking. Off-street loading and unloading areas shall be surfaced with a dustless, durable, all-weather pavement, which shall be adequately drained, all subject to the approval of the Township Engineer. Any use which can reasonably be expected to have a number of trucks making deliveries or pickups on a daily basis which may require delays in order to make such deliveries or pickups shall, in addition to any required loading space, provide truck waiting or standing area in order to avoid undue or unsafe interference with the public use of streets or alleys. Outdoor storage of any type shall not be permitted unless such storage is normally incidental to the permitted use or structure and part of the normal operations conducted on the premises. All outdoor storage shall be subject to the requirements of the prevailing zoning district, including setbacks, area and coverage requirements, and shall be screened as provided for in § 405-62A(4) from any property used or zoned for residential purposes or whenever required by an approving authority in order to eliminate or reduce an adverse effect or impairment of visual or aesthetic scenes. No front yard area shall be used for open storage of boats, vehicles or any other equipment or material except for parking of properly registered automobiles on driveways in residential districts. Aerial and ground seeding and spraying of land and crops. Application of fertilizers, pesticides and herbicides. Use of tractors and other power-driven wheeled and tracked vehicles. Use of farm laborers (local and transient). All the foregoing activities are permitted for the purpose of producing, from the land, agriculture products such as vegetables, grains, hay, fruit, fibers, wood, shrubs, flowers and seeds and for raising livestock. Farming activities shall be conducted in accordance with generally accepted agricultural practices and may occur at any time, including Sundays and holidays. These activities also may occur at any hour of the day or night. The noises, odors and fumes which are reasonable and necessary to farming are included as inherent parts of the right to farm. It is expressly found that whatever nuisance may be caused to others by such uses and activities so conducted is more than offset by the benefits from farming to the neighborhood and community and to society in general, by the preservation of open space, the beauty of the countryside and clean air, and by the preservation and continuance of farming operations in Upper Deerfield Township and in New Jersey as a source of agricultural products for this and future generations. The approving authority shall require developers of major subdivisions to provide perspective purchasers of lots within the subdivision with written notice that Upper Deerfield Township has a Right to Farm Ordinance, which notice shall include a copy of this § 405-30. The developer shall provide the Zoning Officer with proof that said notice was provided as a condition to the issuance of an initial (new construction) certificate of occupancy. Editor's Note: See also Ch. 315, Right to Farm. All signs and signals owned and operated by the Township of Upper Deerfield, the County of Cumberland, the State of New Jersey or the United States of America not exceeding two square feet in area. Identification signs for public and quasi-public facilities, such as schools, churches, hospitals or libraries, not exceeding two square feet in area. Memorial or historical markers or tablets, not exceeding four square feet in area. Customary on-site real estate signs temporarily advertising the sale, rental or lease of the premises or portions thereof and professional office or home occupation nameplates. No such sign shall exceed six square feet in area, nor shall there be more than one such sign for each 200 feet or part thereof of road frontage contained on the property on which such sign is to be located. Such signs shall be removed at the expense of the advertiser within 15 days after the termination or completion of the matter or business advertised. Street number designations, postal boxes, on-site directional and parking signs, warning signs and signs posting property as "Private Property," "No Hunting," "No Trespassing" or similar signs which do not exceed two square feet in area. Daily or diurnal signs not exceeding six square feet in area shall be permitted to be displayed on the property of any business owner advertising or displaying to the public information on a daily basis pertaining to and relating to business conducted on the premises, such as whether a sale is ongoing, business hours, whether the business is open or closed, and similar such purposes; provided, however, that such signs shall not be permanently placed, shall be placed on the business premises not earlier than dawn and shall be removed on a daily basis not later than dusk; and provided, further, that such signs shall not be placed within the public right-of-way nor shall such signs be placed so as to a present a visual obstruction to motorists along any highway or near any intersection. No more than three signs per property shall be allowed to be placed on a daily basis. To the extent of any inconsistency herewith, § 405-30D(2) is deemed inapplicable with respect to daily signs placed upon a business owner's own property. Any person violating the provisions of this Subsection A(6) shall be liable to receive a written warning for the first violation; a fifty-dollar fine for a second violation; and one-hundred-dollar fine for any third or subsequent violations. No such signs shall be placed within the right-of-way of any Township road nor such as to obstruct vehicular or pedestrian traffic. Such signs shall be placed at a minimum of at least 15 feet from the roadway edge of any roadway. Banners, flags, or pennants not exceeding 16 square feet in size shall be permitted to be displayed on the property of any business owner advertising or displaying information to the public on a daily basis pertaining and relating to the business conducted on the premises such as whether a sale is ongoing, business hours, whether the business or open or closed, and similar such purposes, provided that such signs shall not be permanently placed, shall be placed on the business premises not earlier than dawn and shall be removed on a daily basis not later than dusk, and provided further that such banners, flags and pennants shall not be placed within the public right-of-way nor shall such banners, flags, and pennants be placed so as to present a visual obstruction to motorists along any highway or near any intersection. No more than three banners, flags, or pennants per property shall be allowed to be placed on a daily basis. The size of any one banner, flag, or pennant shall not exceed 16 square feet. For the purpose of determining the number of signs, a sign shall be considered to be a single display surface or display device, containing elements organized, related and composed to form a unit. Where matter is displayed in a random manner without organized relationship of elements or where there is a reasonable doubt about the relationship of elements, each element shall be considered to be a separate sign. The size of any sign for the purpose of determining its compliance with the provisions of this section shall be computed by multiplying its greatest height by its greatest length, exclusive of supporting structures, unless such supporting structures are illuminated or are in the form of a symbol or contain advertising copy. Signs with multiple exposures shall be measured for area by using the surface area of one side only when carrying the same message on all sides. Where there is a different message on any side, then each side shall be considered as an individual sign. No freestanding sign shall exceed the height permitted as set forth herein and in no case exceed the maximum height limitation for the zoning district in which it is located. No attached sign shall be higher than 18 inches at any point than the roofline of the building to which said sign is attached. No attached sign shall project into or hang over a street right-of-way, and no sign shall project beyond a building in a manner placing it above areas traversed by motor vehicles, such as but not limited to driveways or parking areas. All signs shall conform to the standards of the Uniform Construction Code. Illuminated signs shall be so arranged as to reflect the light glare away from adjoining premises and away from adjoining streets and/or rights-of-way. No sign shall be illuminated between the hours of 1:00 a.m. and 7:00 a.m. unless the business or use so advertised by said sign is open to the public later than 1:00 a.m., in which event any such establishment may keep said sign illuminated until said business is closed to the public, but not thereafter. Signs and sign structures of all types shall be located to allow clear, unobstructed lines of vision as specified in § 405-18 of this chapter. All sign support structures and frames shall be constructed of durable material such as wood, metal, stone or concrete. All signs shall be permanently fixed to the ground or attached to a building or structure in a manner conforming to the Uniform Construction Code. No sign shall be erected containing information on it which states or implies than a property may be used for any purpose not permitted under the provisions of this chapter in the zoning district in which the property to which the sign relates is located. No sign shall be erected within any sight triangle area as required by § 405-62 of this chapter. Whenever a land use or activity has approved access on more than one roadway, the Planning Board may permit additional freestanding signs. The Board shall determine the size and location of said additional freestanding sign based on available frontage, roadway speed, visibility of the access and the safety of traffic based on specific sign standards permitted for that land use as set forth in Subsection E herein. Signs with red, green or blue illumination in a beam, beacon or flashing form resembling an emergency light, in any location. Portable signs, i.e., fixed on a movable stand which is self-supporting without being firmly embedded in the ground, supported by other objects, mounted on wheels or movable vehicles or made easily movable in some other manner. Signs using mechanical or electrical devices to revolve, flash or display movement or the illusion of movement. Signs with any lighting or control mechanism which cause radio or television interference. Any sign which is such a form, character or shape as to confuse or dangerously distract the attention of the operator of a motor vehicle. Any advertising which uses a series of two or more signs or units placed in a line parallel to the highway or in similar fashion, all carrying a single advertising message, part of which is contained on each sign. Signs which in any way simulate official, functional, directional or warning signs erected or maintained by the State of New Jersey, County of Cumberland or the Township of Upper Deerfield thereof or by any railroad, public utility or similar organization concerned with the protection of public health or safety. Any sign located on a lot other than the lot occupied by the use, event, product or activity which said sign advertises. Spinners, balloons, or other aerial devices, inflatable figures, or any other moving object used for advertising purposes, whether containing a message or not, shall not be permitted unless a permit for the same has been granted by the Township Committee of the Township of Upper Deerfield. In the case of an opening or reopening of a business or other enterprise, the Zoning Officer may issue a permit for said devices provided that they are installed in such a way as to not be hazardous to persons or vehicles on or off site. A permit for spinners, tethered balloons or other aerial devices or inflatable figures or any other moving object for an opening or reopening shall not be granted for longer than 21 consecutive days. For all other uses of spinners, tethered balloons, aerial devices, or inflatable figures or any other moving object used for advertising purposes, such devices shall be permitted only upon such terms and conditions as may be authorized by permit from the Township Committee of the Township of Upper Deerfield. Any sign exceeding the maximum height of 35 feet or more than 35 feet above grade level. Signs bearing texts of a laudatory nature or including services or product names normally furnished by any such establishment or proprietor, it being the purpose of this article to limit the use of all signs to identification and directional purposes only. Identification signs allow the principal name of the establishment or proprietor and a brief description of the principal goods or services offered. Any sign which, applying contemporary control standards, has as its dominant theme or purpose an appeal to prurient interests. Churches: one freestanding sign not exceeding 40 square feet in area and eight feet in height and set back at least 25 feet from all street rights-of-way and lot lines, plus one attached sign not exceeding 25 square feet in area. Golf courses: one freestanding sign not exceeding 40 square feet in area and eight feet in height and set back at least 25 feet from all street rights-of-way and lot lines; in addition, one sign attached to or freestanding but within 10 feet of the clubhouse or similar structure, said sign not exceeding 25 square feet in area. Private clubs: one sign attached to the building or structure and not exceeding 20 square feet in area or one freestanding sign not exceeding 20 square feet and set back at least 25 feet from all street rights-of-way or lot lines. Apartment and multifamily dwelling complexes: Each development having in excess of four dwelling units may have one freestanding sign along any roadway, provided that there exists at least 200 feet of unbroken road frontage. Such sign shall not exceed eight feet in height; shall be set back from the street rights-of-way and all driveways, whether on or off site, at least 30 feet; from any adjoining property line a minimum of 40 feet; and shall not exceed an area of 40 square feet; and shall be solely for identification of the development. Local retail and personal service activities, convenience stores, eating and drinking establishments and similar uses: Each activity may have one illuminated or nonilluminated sign displaying the name of the use attached flat against the front of the building facade, not exceeding 40 square feet in size or 5% of the front facade of the building, whichever is less. Where the building is designed for rear or side entrance, one nonilluminated sign may be attached flat against the building at the rear and side entrances, each sign not to exceed an area equivalent to half of the sign attached on the front of the building. When such use is located on an arterial or collector road, as defined in the Township's adopted Master Plan, said use may, in addition to the above permitted signs, have one freestanding illuminated sign not exceeding 15 square feet in area and set back at least 15 feet from all street rights-of-way and lot lines. Such freestanding sign shall not exceed 20 feet in height. Offices and financial institutions and similar uses: one illuminated or nonilluminated sign displaying the name of the use either attached flat against the front of the building or freestanding, not exceeding 40 square feet or 5% of the front facade of the building, whichever is less. If freestanding, the sign shall be located not less than 15 feet to any street rights-of-way or lot lines and shall not exceed 10 feet in height. Retail sale of goods and services, funeral homes, animal boarding centers, theaters, indoor commercial recreational facilities and similar uses: Each use or activity may have one sign displaying the name of the use attached flat against the front of the building, not greater than 120 square feet. Where such use is located in a building on property having frontage on more than one street or road, one additional sign displaying the name of the use may be attached flat against the building for each side of said building fronting on a street or road not classified in the Township Master Plan as a minor street. Such sign shall not exceed an area equivalent to half that of the sign on the front of the building. Except within residential districts or whenever such use is located within a planned shopping center and where such use is located on premises situate on and having at least 200 feet of unbroken frontage on an arterial or collector street or road, as classified in the Township Master Plan, said use may have one freestanding sign on each street frontage, provided that such sign shall not exceed 20 feet in height and shall not be larger than 40 square feet in area. No such freestanding sign shall be located closer than 100 feet to any residential district or property line of a property used for residential purposes or be closer than 15 feet to any street or road right-of-way. Supermarkets, lumberyards, department, variety, major appliance and furniture stores, and garden centers: Each use may have one illuminated or nonilluminated sign displaying the name of the use attached flat against the front of the building, not exceeding 120 square feet or 5% of the front facade of the building, whichever is less. Where the building(s) is designed for rear or side entrances, one sign may be attached flat against the building at the rear and side entrances, each sign not to exceed an area equivalent to half that of the sign on the front of the building. Except within residential districts or whenever such use is located within a planned shopping center and where such use is located on premises situate on and having at least 200 feet of unbroken frontage on an arterial or collector street or road, as classified in the Township Master Plan, said use may have one freestanding sign on each street frontage, provided that such sign shall not exceed 20 feet in height and shall not be larger than 40 square feet in area. No such freestanding sign shall be located closer than 100 feet to any residential district or property line of a property used for residential purposes or be closer than 15 feet to any street or road right-of-way. Multi-office buildings or complexes and professional office center or similar uses: Any use may have one sign, either freestanding or attached, not exceeding an area equivalent to 5% of the first-floor portion of the front facade or 150 square feet, whichever is smaller. Where an individual office unit has direct access from the outside, a sign not exceeding four square feet identifying the name of the office may also be attached to the building at the office entrance. If freestanding, the sign shall not be closer than 15 feet to any street right-of-way or lot lines, nor shall said sign exceed eight feet in height. A freestanding sign shall not exceed an area of 100 square feet. Hotels and motels or similar uses: Any use may have one sign attached flat against the front facade of the building and not exceeding an area equivalent to 5% of the first-floor portion of the front facade or 150 square feet, whichever is smaller. Where additional uses are to be permitted in connection with a motel or hotel, such as a restaurant or shops, additional signs shall be permitted, but all such signs visible from the public right-of-way shall not exceed 10 square feet in area or total more than two for any one side of the building in addition to the main or principal sign. Except within residential districts or whenever such use is located within a planned shopping center and where such use is located on premises situate on and having at least 200 feet of unbroken frontage on an arterial or collector street or road, as classified in the Township Master Plan, said use may have one freestanding sign on each street frontage, provided that such sign shall not exceed 20 feet in height and shall not be larger than 40 square feet in area. No such freestanding sign shall be located closer than 100 feet to any residential district or property line of a property used for residential purposes or be closer than 15 feet to any street or road right-of-way. One illuminated identification sign attached flat against the wall of the front facade (street side) of the building for each use within the center. Said sign shall not exceed one square foot per linear foot of frontage of the individual use or 100 square feet in area, whichever is smaller. Such signs shall not extend above the roofline of the building to which they are attached. In areas having common walkways roofed over with a permanent solid or rigid canopy (not canvas or awning), there may be one nonilluminated sign for each business, with such sign being attached in a perpendicular fashion from the underside of the canopy and not exceeding four square feet in area on either of the two sides. Each building or use may have one nonilluminated directory sign per principal entrance for all business occupants. Such signs shall be attached flat against the facade of the building and shall not exceed four square feet in area. In addition, each permitted use may have one identification sign on each window and awning, provided that such signs do not exceed four square feet in area. All signs in a shopping center shall conform in character to all other signs in the complex and shall blend with the overall architectural scheme of the shopping center structure. Nothing herein shall be construed to imply control or the setting of standards for signs located entirely within a structure and not visible from the exterior of the structure, including through windows or entrances in or to said structure. Service stations, repair garages and car washes: Each use may have one freestanding sign and one sign attached flat against the front facade of the building. The freestanding sign shall not exceed an area of 20 square feet and shall be set back at least 15 feet from all street rights-of-way and lot lines. The freestanding sign shall not exceed a height of 20 feet. The attached sign shall not exceed 30 square feet in area or rise above the roofline of the structure to which it is attached. Whenever a service station is established with a mini market or convenience store or in combination with another related land use such as a car wash, then the overall site may have only one freestanding sign as noted above. Attached signs to the various uses on site shall be limited to identifying the use or activity. In addition to the above permitted signs, a gasoline service station or repair garage may have signs identifying automotive services being performed within a given portion or bay of the building attached flat against the building and directly above that portion or bay of the building wherein said service is performed. Such signs shall not exceed six square feet in area and shall not be illuminated directly. Laboratories, industrial and manufacturing or processing plants, wholesale distribution centers and warehouses, construction enterprises, metalworking enterprises and similar uses: Each use shall be permitted one sign not larger than 5% of the front of the principal building or 100 square feet, whichever is smaller. If attached to the building, the sign shall not be higher than the roofline and, if freestanding, shall be set back from all street right-of-way lines at least 15 feet and from all lot lines at least 50 feet. Industrial parks. Each park may have one freestanding sign along each arterial or collector road, as classified in the Township Master Plan, upon which the tract in question abuts, provided that there exists at least 250 feet of unbroken frontage. Such sign shall not exceed a height of 20 feet, shall be set back from all street rights-of-way and driveways at least 20 feet, shall be set back from any property line a minimum of 100 feet and shall not exceed an area of 150 square feet. Each use within an industrial park shall be permitted signs in accordance with the provisions of Subsection E(13) above. One sign displaying the name and insignia of the business or use attached flat against the front of the principal building used for sales office and/or showroom, not exceeding 120 square feet or an area equivalent of 5% of the front facade of the building, whichever is less. One attached sign not exceeding 20 square feet in area, which sign or signs identify specific areas of a structure utilized for accessory uses, such as garage, office or service areas. Said sign(s) shall be located directly above or in close proximity to the entrance to said portion of the principal structure or accessory structures. Construction sites. Each construction site may have one sign identifying construction on site, not larger than the equivalent of 5% of the area of the front wall of the building being constructed or 100 square feet, whichever is smaller. The size shall not exceed 10 feet in height and shall be set back from all street rights-of-way and lot lines at least 40 feet. Said sign shall be removed prior to the issuance of a certificate of occupancy for the building under construction or the use being established. Real estate sale or rental. Real estate developments offered for sale or rent, involving 10 acres or more or in excess of 10 lots or dwelling units, may have one sign along each arterial or collector road which the tract involved abuts for each 100 feet of unbroken frontage, with a maximum of two signs per site or development. Such sign shall not exceed eight feet in height, shall be set back from the street rights-of-way and driveways so as not to overhang the same or obstruct vision, shall not exceed an area of 32 square feet, and shall be used only to display the development name, developer's name, sales representative, location, sales office and number and to display times and artwork designed to demonstrate project layout, appearance and logo. Such sign(s) shall be removed after the sale of 90% of the lots or units or within one year. Extensions of time may be granted by the Planning Board upon submission of evidence which reasonably justifies continuation of the sign permit. Grand openings, special sales, major retail events or other similar special activities: Any bona fide use or business may apply to the Zoning Officer for the erection, placement or attachment of banners, spinners, pennants, flags or other similar objects or devices in connection with a grand opening celebration, special sale, major retail event or other special activity or event. No more than two permits for such use of said objects shall be granted to the same use in any given calendar year. Use of the objects so permitted shall be limited to a maximum period of 21 days per permit. All such use of the devices or objects shall be approved by the Zoning Officer and shall conform to the requirements of Subsection C herein. Home occupations: A home occupation may have one sign bearing the name of the person engaged in the home occupation and the profession engaged in or the name of the business, which sign shall not be illuminated, shall be situated within the property lines of the premises it identifies, and shall not exceed two square feet in area. Signs identifying the office of a physician or surgeon may be illuminated. Roadside stands: A maximum of three temporary off-site signs shall be permitted during periods of operation only, each not more than six square feet in area. Additionally, 48 square feet of identification sign area shall be permitted either on the stand or within 30 feet thereof. Schools: A school may have one freestanding sign not exceeding 18 square feet in area and eight feet in height set back at least 20 feet from all street rights-of-way and lot lines, plus one attached sign not exceeding 25 square feet in area. In the case of a school with outdoor athletic facilities, scoreboards shall be permitted, provided that they are located not closer than 50 feet from any street rights-of-way or property lines. Other uses: Whenever it is proposed to erect, construct or install a sign for a use or structure, as permitted under the provisions of this chapter, which use does not generally approximate a use set forth in this section as to sign details, the Zoning Officer may issue a sign permit for one sign not to exceed 50 square feet in area which meets the maximum setback requirements for an accessory use in the district where the proposed sign is to be located. All other cases shall require the approval of the Planning Board. When reviewing a request for a sign, the details of which are not set forth hereinabove, the Planning Board shall be guided by the standards for other or similar uses as set forth herein, the general character of the area wherein the sign is to be located and the purpose of the sign in determining the standards to require. Yard sales: A maximum of four temporary off-premises directional signs measuring not over 24 inches by 18 inches each for a yard sale are permitted. All such directional signs shall be located in accordance with the provisions of this section, except that no sign permit shall be required for these signs. All such signs shall be removed within three days after the sale. No permit is required for any temporary signs which are in the nature of traditional holiday or seasonal greeting or decoration, not advertising a specific product, service or establishment. No such sign shall, however, be erected or placed in such a manner as to be a hazard to the public or facilities designed to promote or protect public health and safety. Temporary signs announcing or advertising any educational, charitable, civic, professional or religious program, project or event are permitted only if erected and allowed to remain for a consecutive period not to exceed 21 days in any calendar year, and provided that they do not exceed 32 square feet in area. The size of any sign is not in excess of 32 square feet in area on one side. The erector of such signs or authorized agents of the political party or candidate removes such signs not more than 60 days after the election to which the sign relates. Notwithstanding the provisions of Subsection F(2) herein, any political sign shall be permitted for periods of longer than 21 days in connection with any bona fide election held, regardless of number. All temporary signs permitted herein shall contain only advertisement copy or information which directly pertains to the business or activity conducted or to be conducted. Such signs shall relate only to a given activity, project, program or event in order to be considered as temporary signs not subject to permit and regulations as set forth in this section. Any temporary signs advertising a civic, charitable, political, religious, professional or similar activity, event, program or project and which are to be erected or placed by a nonprofit organization shall not require a sign or zoning permit so long as they meet the requirements of this subsection. Said sign(s) must be maintained while in use by the person or organization erecting or placing them. Signs proposed for hanging or draping across a public street, road or right-of-way shall require a sign permit and be in accordance with all applicable regulations concerning their design and manner of display. Such signs shall require the issuance of a zoning permit regardless of the nature or purpose of the sign or the group erecting or placing it. No sign, whether new or existing, shall hereafter be erected or altered except in conformity with the provisions of this chapter. However, notwithstanding any provisions contained herein, a sign must be kept clean, neatly painted and free from all hazards, such as but not limited to faulty wiring, loose fastenings or improper support; and said sign must be maintained at all times in such condition so as not to be detrimental to the public health and safety. In the event of a violation of the foregoing maintenance provisions, the Zoning Officer shall give written notice, by certified mail or personal delivery, specifying the named owner of the land upon which the sign is located, sent to the address as stated in the application for a sign permit or as shown on the Township tax records, listing all violations and requiring correction of defects or removal of the sign. The sign shall thereupon be made to conform by the owner of the sign and/or the owner of the land upon which it is located within 30 days from the date of receipt of said notice. Upon failure to comply with such notice within the prescribed time, the Zoning Officer is hereby authorized to remove such sign and shall assess all costs and expenses incurred in said removal against the land and building upon which such sign was located or to take appropriate action as provided for in § 405-113 of this chapter. Any sign advertising an existing business conducted or product sold on the premises upon which the sign is located shall be removed by the owner of the premises upon which such sign is located within 30 days after cessation of the business or activity so advertised. The Zoning Officer, after determining that any such sign exists after such cessation of business or activity, shall notify the owner of the premises, in writing by certified mail or personal delivery, to remove said sign within 30 days from the date of such notice. Failure to comply with the notice in the time prescribed shall be considered a violation of this chapter and appropriate action authorized as set forth in § 405-113. If the Zoning Officer shall find that any sign regulated by this chapter is unsafe or insecure or is a nuisance or menace to the public, said Officer shall give written notice to the named owner of the land upon which the sign is located as shown on the Township tax records or the application for a sign permit, which owner shall remove or repair said sign within 14 days from the date of receipt of said notice or such other time period as set forth in said written notice. If said sign is not removed or repaired within the time period specified, the Zoning Officer shall revoke any permit issued for the sign and shall take what steps are necessary to repair or remove said sign in order to protect the public health and safety and shall assess all costs and expenses incurred from such repair or removal of the sign against the land and buildings on which the sign was located. Such assessment shall become a municipal lien upon the property involved. With respect to any temporary sign permitted under Subsection F above, such sign if not removed by the owner within the time period prescribed may be removed by the Zoning Officer, who is hereby authorized to do so and shall assess all costs and expenses incurred in said removal against the property upon which said sign is located. Said assessment shall become a municipal lien upon the property involved. The following standards and regulations shall apply to swimming pools and ponds. Open pools in excess of 2 1/2 feet in depth are considered swimming pools and as structures for the purpose of permits and regulations of Township ordinances. For the purpose of this chapter, swimming pools, exclusive of patio area, shall not be counted as floor area in computing the lot coverage and shall not be located in any required front, side or rear yard area. All swimming pools shall be at least 20 feet from any property line and shall be enclosed by a fence, wall or other suitable barrier not less than four feet high with a self-closing, self-latching gate and of such a design as is reasonable to prevent unobstructed access to the pool. All swimming pools shall be provided with a filtering system utilizing chlorinated water, meeting New Jersey State Department of Health and Senior Services requirements. All swimming pools shall drain in conformance to a system approved by the Township Engineer. Irrigation and farm ponds. All irrigation or farm ponds shall be designed and constructed in such a manner as to avoid steep slopes or embankments. All such ponds shall be graded and seeded. Fencing and specific drainage requirements shall only be applicable where determined necessary to the public health, safety and general welfare by the Township Committee. Proof is furnished to the Zoning Officer that the proposed use is a bona fide nonprofit activity organized solely for the use and enjoyment of the membership. The parcel involved in the use shall contain at least three acres and shall have 200 feet of highway frontage. No more than a total of 15% of the lot shall be covered by structures, parking areas and the pool, together with its adjoining hard-surfaced areas. No part of the pool, its accompanying hard-surfaced area or other supporting structures or activity areas shall be located within 75 feet of a property line, or less than 300 feet from the nearest dwelling. The maximum membership of the club shall be fixed at the time of application and shall be commensurate with the size of the parcel and the scale and facilities contemplated. No expansion of the membership shall take place subsequently without supplemental application to and approval by the Planning Board. Any pool established in connection with public swimming clubs shall be constructed and operated according to the requirements of Chapter IX, Public Recreational Bathing, of the State Sanitary Code, as set forth in N.J.A.C. 8:26-1 et seq. All pools shall be surrounded on all sides by a yard 25 feet in width, exclusive of parking area. All pools shall have permanent and direct access to a public street. All pools shall be surrounded by a fence at least six feet in height, the entrance to which shall be kept locked when an attendant is not present. All lot boundaries shall be screened in accordance with the screening provisions of § 405-62A(4) of this chapter. Adequate parking shall be provided in accordance with the provisions of § 405-27. A recreation area shall be dedicated and improved by the developer for any development containing more than seven residential units. A residential unit shall include any dwelling or living area designed to include one or more sleeping quarters. Said recreation area shall consist of at least one acre or 3,000 square feet per residential unit in the development, whichever is greater. All land and recreation areas shall be cleared as required, graded for proper drainage, leveled, topsoiled, limed, fertilized and seeded with athletic field and general purpose mixture in accordance with specifications contained in Lofts Seed, Inc.'s Guide to Seed and Sod in United States and Canada, current edition, and must be suitable for playing playground games, such as touch football and softball, on an informal basis. The recreation area shall meet all design standards as set forth in this chapter. The recreation area shall not include any wetlands, wetlands transition areas of any kind, streets, drives or space occupied for off-street parking or loading purposes for other facilities. The recreation area shall be contained within the development and entirely within Upper Deerfield Township and readily accessible to all lots intended for residential development. The development shall provide for a homeowners' association for the ownership and maintenance of the recreation area for the benefits of owners or residents of the development unless the Township accepts dedication of the recreation area. Monetary contribution in lieu of recreation area. In lieu of the recreation area required by Subsection A(1) herein above, the developer may elect, with approval by the Planning Board, to make a contribution of $3,000 per residential unit to a Recreation Trust Fund maintained by the Township specifically for the periodic purchase, lease, acquisition and/or maintenance of recreational facilities for use by the residents of the Township of Upper Deerfield. Said contribution shall be paid at the time of final approval and before the signing and release of any subdivision plats. Any lands proposed as open space shall be improved to best suit the purpose(s) for which open space is intended. Common open space to be administered by a homeowners' association or other open space organization shall be distributed throughout the proposed development so that as many residential dwelling units or buildings as are practicable abut and have direct access to the common open space. The protection of environmentally fragile and important resource land areas, such as aquatic and wetland buffer areas, one-hundred-year floodplain and treed acreage, is a high priority. The Planning Board shall review the submitted common open space plan in the context of the particular development proposal, the particular characteristics of the subject land area and the ability, desirability and practicality of relating the proposed open space to adjacent and nearby lands. In any case, the lands shall be improved as may be necessary to best suit the purpose(s) for which they are intended. Should the proposed development consist of a number of development phases, the Planning Board may require that open space acreage be proportionate in size to the development phases being considered for final approval for that particular development phase, even though these lands may be located in a different section of the overall development. Open space may be offered by deed to the Township or dedicated as common open space to a homeowners' association or other open space organization. If the applicant proposes that the open space be dedicated to the Township, then the Planning Board shall forward such request with its recommendations to the Township Committee prior to the granting of preliminary approval of any development application containing the subject open space. All open space not offered to and/or not accepted by the Township shall be owned and maintained by a homeowners' association or other open space organization, as provided in N.J.S.A. 40:55D-43. Such organization shall not be dissolved, nor shall it dispose of any common open space by sale or otherwise. The developer shall provide a minimum contiguous area within lands of the designated open space not considered environmentally fragile as set forth in Subsection A(6)(c) above of at least 200 feet by 100 feet in size. The area shall not include any roads, streets, rights-of-way, detention or retention basins or portions of the development side aside for other required uses. Editor's Note: Original § 98-24.1, Keeping of swine, added 7-7-1983 by Ord. No. 251, was deleted 9-1-1988 by Ord. No. 316. Any turbine more than 100 feet tall must be of monopole construction to qualify for a zoning permit. Lattice towers and guy wires will not be authorized by zoning permit for wind turbines in excess of 100 feet tall. The proposed wind energy-generating facility will not block, interfere or otherwise impair a scenic vista or view for an adjoining residential structure. The wind energy-generating facility and its location on the property involved shall be designed to eliminate any nuisances to surrounding properties and to limit any noise from said wind energy-generating facility from being heard off the property where said wind energy-generating facility is located. The actual side and rear yard setbacks for a wind energy-generating facility shall be determined by the Planning Board and shall be based upon the height of the proposed wind energy-generating facility. The wind energy-generating facilities shall be limited to a maximum height of 120 feet to the tip of the blade at its highest position. No variance shall be granted in connection with a proposed wind energy-generating facility to permit a height greater than 300 feet or the placement of a wind energy-generating facility so close to a property line as to result in any portion of said wind energy-generating facility at any time, whether erect or in the event that the wind energy-generating facility should fall or be toppled, from overhanging, crossing or otherwise extending beyond the property line of the property upon which it is located. No wind energy-generating facility shall be located in any required front yard area. The minimum lot size required for the erection, construction or placement of a wind energy-generating facility on a property shall be five acres. No more than one wind energy-generating facility shall be permitted per parcel. Communication towers shall be limited to a maximum height of 100 feet. No communications equipment shall be located in any required front yard area. Communications equipment shall not be attached to the front facade or roof area of any structure or building. When any dish, disc or satellite antennas is located within 20 feet of adjoining property, it shall be screened with plant material to the extent practical to reduce unsightly appearance without affecting performance. No communications equipment shall be permitted which causes interference or problems for adjoining properties' communications equipment or receipt of television, radio or other communications signals. Wherever practical or possible, communications equipment shall be so located on a property so as not to be visible from the street. Solar energy-generating facilities shall be permitted as an accessory use/structure in connection with any residential, agricultural, recreational, commercial or industrial use when they meet the following standards. The solar energy-generating facilities shall not exceed a height of eight inches above the roof when attached to a residential dwelling unit. Solar energy-generating facilities used in conjunction with a commercial or industrial use shall be screened from the view of persons at ground level by a parapet or similar means. In no event shall the placement of solar energy-generating facilities result in a total height, including the building and panels, greater than the maximum building height permitted in the subject zone district for a principal structure. When solar energy-generating facilities are located within 20 feet of an adjoining property, they shall be screened to the extent practical to reduce unsightly appearance without affecting performance. Wherever practical or possible, solar energy-generating facilities shall be so located on a property so as not to be visible from the street. All ground arrays shall be set back from all property lines a distance equal to or greater than the set back required for an accessory structure within the subject zone. Ground arrays shall not be permitted in a front yard. When utilized as an accessory to an agricultural use, solar ground arrays, in addition to being subject to § 405-34C(2)(b) through (g), shall be set back a minimum distance of 100 feet from any property line. Wherever practical or possible, ground arrays shall be so located on a property so as not to be visible from the street. Installation of vegetation or other materials may be required to satisfy this requirement. Ground arrays shall not exceed a height of 15 feet. Ground arrays shall be considered impervious and shall be calculated as a percentage of lot coverage. Ground arrays shall be located to eliminate any nuisances to surrounding properties. Ground arrays shall not block, interfere or otherwise impair a scenic vista or view for an adjoining residential structure. Wind and solar energy-generating facilities and communications facilities shall not be used for displaying any advertisement except for reasonable identification of the manufacturer or operator of the system. In no case shall any identification be visible from a property line or public right-of-way. The design of wind and solar energy systems and communications facilities shall, to the extent reasonably possible, use materials, colors, textures, screening and landscaping that will blend the facility into the natural setting and existing environment. The primary purpose of solar and wind energy-generating facilities is to provide power for the principal use of the property where said facility is located and shall not be for the generation of power for commercial purposes, although this provision shall not be interpreted to prohibit the sale of excess power generated from time to time from a solar or wind energy-generating facility designed to meet the energy needs of the principal use. The annual energy-generating capacity of a solar or wind energy-generating facility shall be limited to the previous calendar year's energy demand plus 10% or to occupying no more than 1% of the subject parcel, whichever is less. The limit on the annual energy-generating capacity established pursuant to Subsection G shall not include energy generated from facilities, structures or equipment existing on the roofs of principal buildings as of the effective date of this section. Construction and erection of wind and solar energy facilities and communications equipment shall be subject to the Uniform Construction Code and shall at no time constitute a threat to public safety or welfare. No solar or wind energy-generating facility or communications facility shall be established or constructed unless a construction permit, and a zoning permit evidencing the compliance of such use or structure with the provisions of this section, shall have first been issued. Site plan approval in accord with Article XI of this chapter of the Township Code shall be required for all ground-mounted solar panels proposed in conjunction with a commercial, industrial, mixed-use, or residential use involving three or more dwelling units. Notwithstanding the requirements contained in § 405-34 of this article, renewable energy facilities approved by the Upper Deerfield Township Planning Board shall be subject to the requirements contained in § 405-56B through I, inclusive, of this chapter.